The weather may not be in full Spring swing just yet, but my mind totally is. 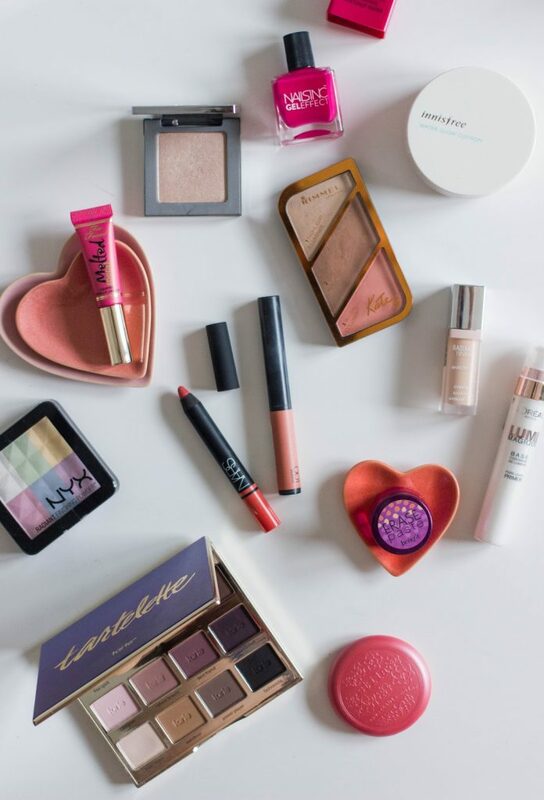 I’ve traded out my Winter capsule wardrobe for a somewhat less black affair, and I’ve moved my makeup around so I can reach for lighter, brighter picks. And I’ve been digging it, after what feels like the longest Winter ever, it’s been nice to switch things up. I’m onto my second tube of the L’Oreal Lumi Magique Primer, it’s my favourite glow-giving base from the drugstore. I take a pump of this and just massage it into the skin before foundation, and it just brightens things up and makes my skin look much healthier. If you read this post then you won’t be surprised to know that the Innisfree Water Glow Cushion Foundation is my foundation pick. This applied with the beauty blender just gives a great, natural, glowy finish, and I’m obsessed with it. Concealer-wise, I’ve gone back to reaching for my Benefit Erase Paste, a creamy, salmon-y toned concealer that is perfect for neutralising dark circles. I find that this blends into the under eyes really easily, and it looks super natural, so it works well with the Innisfree foundation. I’ve also been using the Bourjois Radiance Reveal Concealer, which is nice and light, but blends beautifully into the skin. Now normally, with this kinda base I wouldn’t powder, but I’ve been obsessed with the NYX Radiant Finishing Powder. It’s kinda a hybrid between a highlighter, setting powder and colour corrector – it does all three but in a subtle kinda way. It gives a good dose of glow! My go to blush recently has been the Stila Convertible Colour in Petunia, if there was ever a colour that represented Spring – this would be it! I love that because this is a cream blush, it blends into the cushion foundation well, and looks super natural, but it’s quite tacky, so it lasts well on the skin. The other thing I’ve been reaching for is the Rimmel Sculpting Palette in Coral Glow, a pretty, shimmery trio that is a real bargain from the drugstore. To say my love affair with the Urban Decay Afterglow Highlight in Sin is anything short of an obsession, would be a total disservice. This stuff is like pressed magic, sheeny, wondrous goodness. I think I could throw out all my other highlighters and be happy with just this for the rest of my life. For eyes, I’ve pretty much exclusively been using the Tarte Tartelette Palette. It’s colour range is so unlike anything else I own, warm peachy and purple-y tones that normally I’d shy away from. I love how all the shades in this palette blend so well with each other, and you can really wear any combination of shades. Two lip mentions, the L’Oreal Infallible Matte Max Lip Colour in 001 Silencio, a gorgeous matte peach, which is probably my current favourite lip product – longwearing but undetectable. I’ve also been loving the NARS Satin Lip Pencil in Lodhi, a gorgeous orange coral which should be out of my comfort zone but somehow isn’t. And lastly, I’m totally obsessed with the Nails Inc Gel Effect Polish in Chelsea Grove, which just makes me happy when I look at it. Isn’t it the prettiest colour ever?